In this entry I offer some tips and product ideas worth considering. I hope you find something you can apply. Try Gamblin radiant oil colors. They’re truly “radiant” and more light reflective than other oil colors. The radiant white is fantastic for mixing bright light colors. The others are gorgeous pastels to use straight from the tube or mixed with other colors. I use them to add a lively note to grays. My personal favorite is Radiant Violet. Titanium White from the Bob Ross Floral Soft Oil Colors assortment is incredibly soft and facilitates smooth blending. Pink is another versatile choice. If you paint landscapes, use pink to make greens both lighter and dustier. Charvin Extra Fine oil colors are made with poppy seed oil. They’re wonderfully creamy and responsive to your brushstrokes, won’t yellow, and mix with all oil paints. Try white and a couple of trial colors. Poppy seed oil also comes in bottles for adding to paints. It dries slower than linseed oil, so if you like a soft painterly look, they’re worth exploring. Some artists use their easels as palettes! They squeeze out their paints on regular palettes, but mix colors right on the easel supports! Use wood or metal easels, full scale or tabletop. Acrylic paints are practical because they dry fast, but oil paints work beautifully, too. After completing some paintings this way, you'll have generated a bonus masterpiece: an avant-garde artwork in the form of an easel. 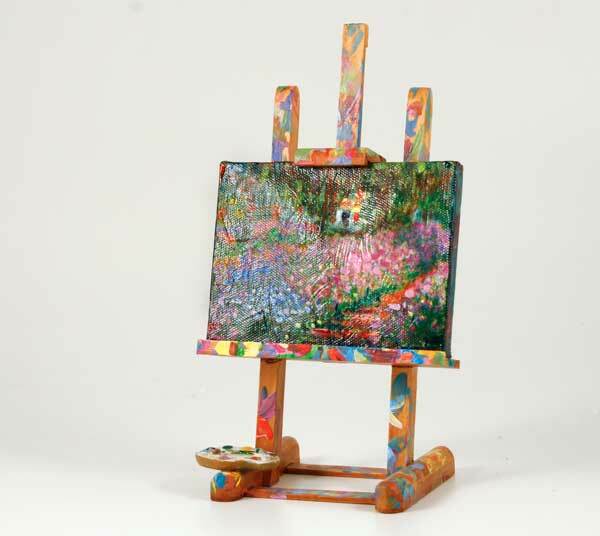 Your colorful easel will serve as an attention getter for displaying your paintings, too. Try amazing transparent effects over a thoroughly dry oil painting. It works best on paintings of flat texture without heavy brushstrokes. Mix a solution of retouch varnish and 10% transparent oil color. I create a neutral from ultramarine blue and burnt sienna, but color is up to you. Lay your painting flat and use a soft brush to coat the entire surface with the varnish solution. For areas where you want less color concentration, use varnish only. Now splatter and dribble turpentine onto the wet coating. Rings and organic shapes will develop and spread as the coating dries. To minimize the spreading effect dry your painting quicker by laying it in the warm sun--if possible. Create amazing effects by mixing a solution of 50% acrylic paint with 50% water. Apply the mixture to a dry canvas or board, which may or may not have been coated with acrylics. While the solution is still wet on your surface, splatter, drop, or dribble 91% alcohol onto your surface. The alcohol creates exciting rings and spots. Move the color around with a chopstick or brush handle. If you tilt your canvas, the alcohol will marbleize the paint. Try mixing metallic paint or iridescent powder into your 50-50% solution. Alcohol makes the metallic color separate from your acrylic color, creating outlined rings and surprising effects. Create layers of effects, letting the canvas dry flat between applications. This technique makes wonderful backgrounds as well as being their own statements. Adding new products and techniques to your repertoire can put a jolt of freshness into your art without significantly changing your narrative. I have no affiliation with the products mentioned. This article first appeared in the February issue of "The Creative Edge," the newsletter of the California Art League.